The travel pillow has been one of the most essential accessories for long distance traveling whether by road or air. People also use it for camping. But the greatest challenge is that the standard travel pillow is not modular, therefore, one has to purchase them in different sizes. They are also difficult to clean. The shortfalls of the standard travel pillow led to the creation of the first modular travel pillow known as Candy Cane. Why the name Candy Cane? The name originates from the design initiated Nisnas industries in conjunction with LyLy Designs. The cute design is in the shape of a candy cane, which is all about the product being practical and modular. Candy Cane was created to address three major issues that travelers face. Travelers like to travel light; an aspect that Candy Cane has considered through its inflatable design. In its deflated form, the travel pillow can be folded to a fist size thus making it easy to carry. The Candy Cane is easy to use as travelers only need to unfold it, and inflate it in a second using an easy and fast mechanism. It is also comfortable to use especially when compared to the standard travel pillows. Users are able to manipulate the softness by rolling the top up or down. This can happen when the pillow is inflated or deflated. Using Candy Cane will change your travel experience while in the air or on the road. 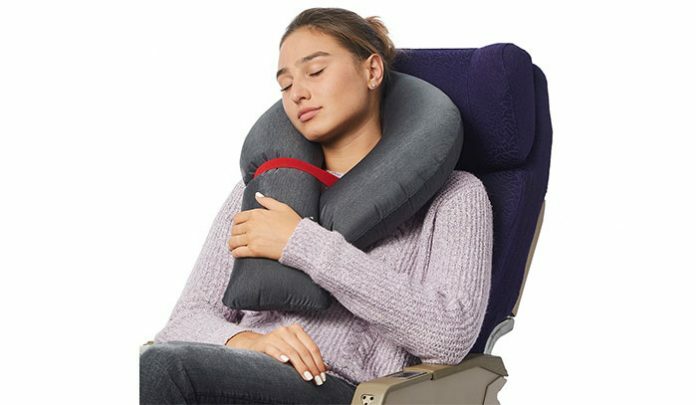 The travel pillow wraps around your neck and offers complete chin support hence keeping your head in an upright position. This is the best position for sleeping while seated upright, almost mimicking the head position while sleeping on the bed. It has a special polymer inner lining that facilitates entrapment of air that is blown into it. It is easy to inflate as all the user needs to do is place their head 10 inches away from the Candy Cane opening, and blow into it. Anyone can inflate it in a matter of seconds. You could also use a car or aeroplane air conditioning vents to inflate it. Candy Cane is designed with a double wall to enhance toughness thus making it durable. It is also fitted with a strap that has two functions. A carrying handle when it is deflated and an adjustable strap when inflated. Once inflated, the pillow is folded and one end placed on through the strap making it adjustable. This feature enables the pillow to fit through all head sizes. Candy Cane has multiple advantages – one being that it is easily washable. Since it is not made with filling material and is filled with air, once deflated it can be washed and will dry faster. It can also be cleaned when inflated. The fact that users inflate the pillow from 10 inches away means that it is hygienic and can be shared. Sweat and drool are washable and the pillow dries fast for next time use. It is perfect for sleeping on the floor, leaning against the wall or traveling in a pair. No more hassles of bulky uncomfortable travel pillows, book your Candy Cane pillow on Kickstarter. It is expected to be shipped in Mar 2019.